No Chopping or Dicing Required and Ready to Eat in 15 minutes! 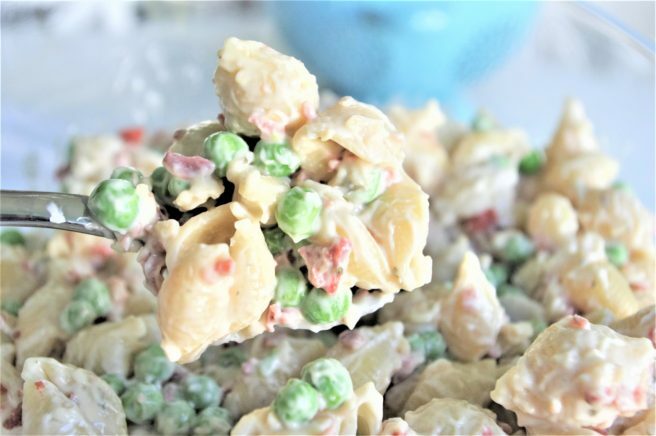 This quick and easy pasta salad, packed with everyone’s favorite flavors (BACON and RANCH for the WIN) is the perfect last minute side dish to bring to any spring holiday potluck or summer barbecue! Whether you are grilling up dinner in the backyard, hosting a family cookout celebration for 4th of July, need a really yummy pasta salad side dish for the annual block party dinner, realize you don’t have enough food prepared for the family reunion picnic in the park because cousin Jerry and his family of nine forgot to RSVP, just saw the sticky note you wrote yourself assigning YOU the pasta salad for the Memorial Day community potluck that starts in half an hour… (based on a semi-true story) … So many reasons to need a GO TO, ready in 15 minutes pasta salad side dish recipe handy that’s always a crowd pleaser! 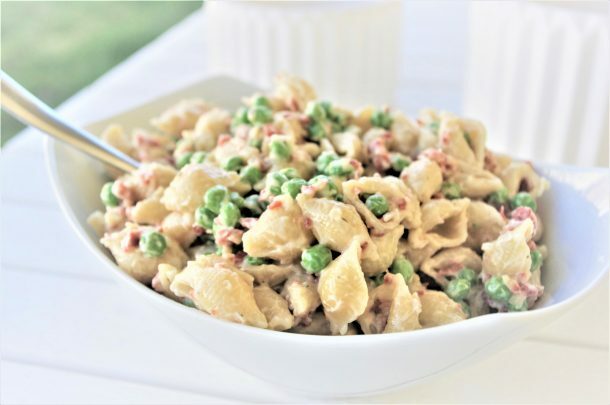 Easy Creamy Bacon Pea and Ranch Pasta Salad Side Dish Recipe – No chopping or dicing required and perfect for 4th of July and Memorial Day picnics, potlucks, block parties and barbecues. NO waiting! Simple crowd favorite that’s quick and ready to eat in 15 minutes. SO YUMMY, SO FAST! 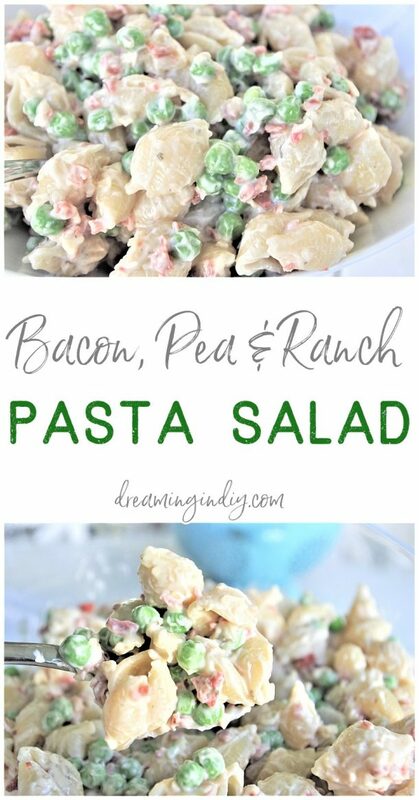 Make sure to PIN THE IMAGE BELOW to save your new favorite pasta salad recipe to make again and again! You are going to LOVE how quickly and easily this comes together and your hungry family and dinner guests are going to devour it in a flash! Be sure to bring a copy (or seventeen) of the recipe with you or be prepared to collect email addresses and phone numbers to text the link to this recipe. You are going to be asked for it. Repeatedly. All you need to do is boil your pasta, mix the ingredients together and BOOM! Ready to eat IMMEDIATELY and absolutely delicious. BONUS: It’s also amazing the next day. Not that you are going to have leftovers, truschoome. 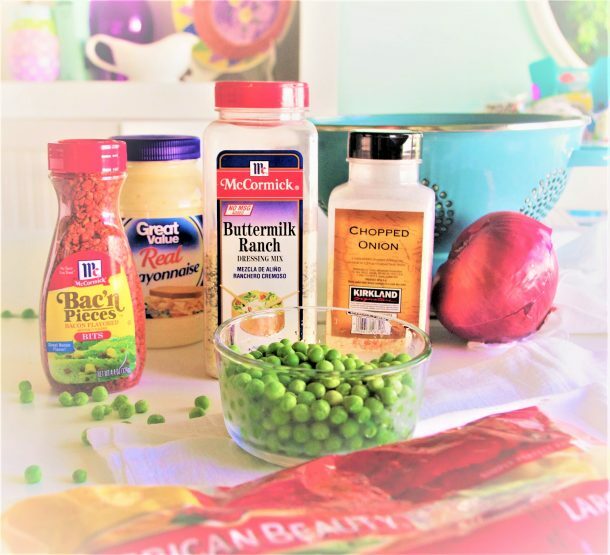 1/4 Cup Dried Chopped Onion (or if you wanna be all fancy – 1/2 a large onion or one small onion diced into teeny tiny itty bits) You could also use 1-2 Tablespoons of Onion Powder if you have a texture aversion. You can adjust the amount depending on how oniony you like things. I am an onion lover from way back, but you do you. Get your choice of pasta started boiling and set your timer according to the directions on the package. I tend to like to lean toward the middle “firm” timing when I’m making a pasta salad. That way when you stir it all together they hold their shape and stay all pretty. Pretty is important. But either way it will be yummy. 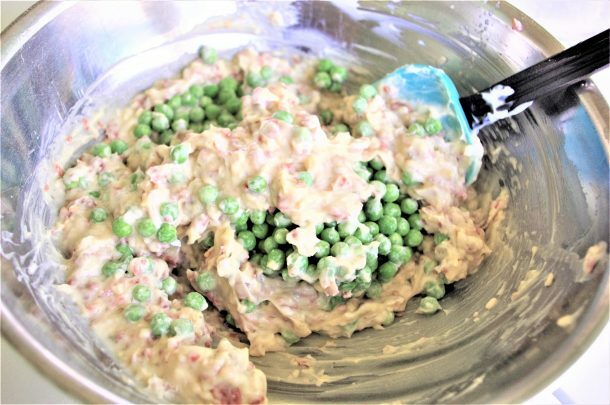 While your pasta is boiling, in a large bowl, mix together your mayo with all of the other ingredients really good – adding the frozen peas last. Let that all meld together and the flavors marry up while your pasta finishes its biz on the stove. When your timer goes off, strain your pasta. If you are a pasta rinser, I strongly urge you to change your ways. DO NOT rinse your pasta. Every time you do that, an Italian angel loses his wings. Fact. STRAIN your pasta, but please, for the love of flavor and texture, do not rinse it. If you won’t do it for yourself, do it for me. 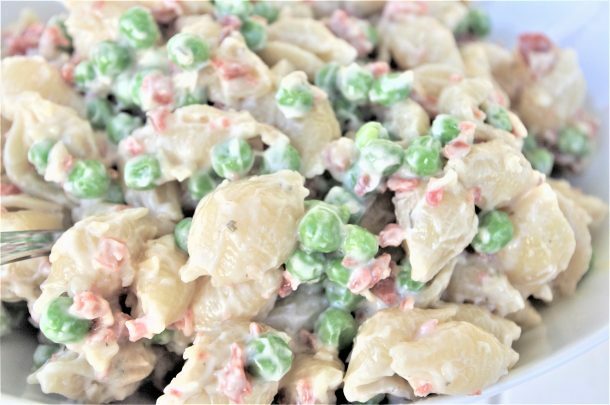 The frozen peas cool down your pasta in a hurry and it all mixes up nice and creamy! Now throw it in a pretty bowl (with your name DIY etched/written in masking tape on it so you get it back of course) and serve! You will not be disappointed and you will FOR SURE be invited back. And assigned the pasta salad. Every time. Here’s the printable version of this yummy recipe for you. Enjoy and make sure to share! 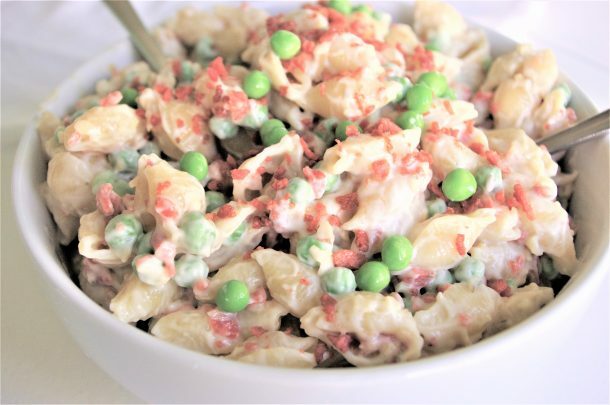 Easy Creamy Bacon Pea and Ranch Pasta Salad Side Dish Recipe - No chopping or dicing required and perfect for 4th of July and Memorial Day picnics, potlucks, block parties and barbecues. NO waiting! Simple crowd favorite that's quick and ready to eat in 15 minutes. SO YUMMY, SO FAST! 16 oz. pasta of your choice. 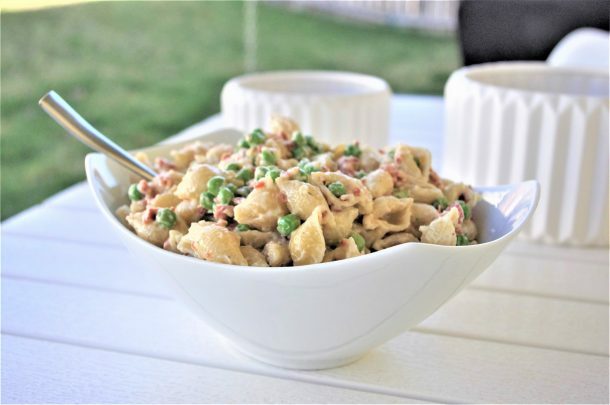 I personally prefer Large Pasta Shells- they seem to really trap the yummy flavors inside so each bite is delish! 1/4 Cup Dried Chopped Onion (or if you wanna be all fancy - 1/2 a large onion or one small onion diced into teeny tiny itty bits) You could also use 1-2 Tablespoons of Onion Powder if you have a texture aversion. You can adjust the amount depending on how oniony you like things. Get your choice of pasta started boiling and set your timer according to the directions on the package. I tend to like to lean toward the middle "firm" timing when I'm making a pasta salad. That way when you stir it all together they hold their shape and stay all pretty. Pretty is important. But either way it will be yummy. 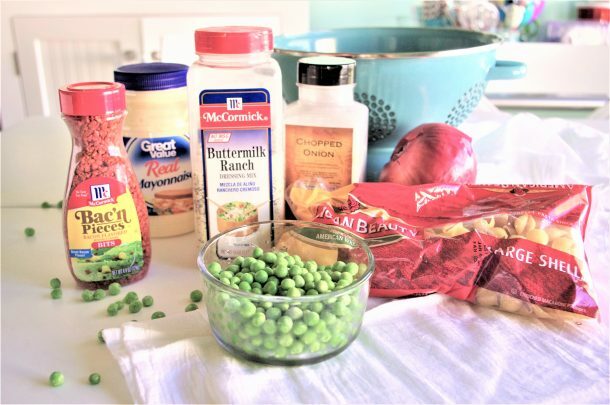 While your pasta is boiling, in a large bowl, mix together your mayo with all of the other ingredients really good - adding the frozen peas last. Let that all meld together and the flavors marry up while your pasta finishes its biz on the stove. When your timer goes off, strain your pasta. If you are a pasta rinser, I strongly urge you to change your ways. DO NOT rinse your pasta. Every time you do that, an Italian angel loses his wings. Fact. STRAIN your pasta, but please, for the love of flavor and texture, do not rinse it. If you won't do it for yourself, do it for me. 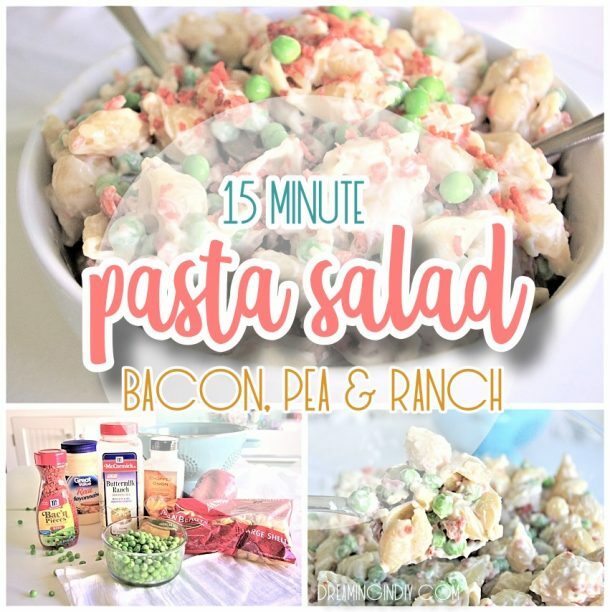 While you’re here – check out all of these other AMAZING Pasta Salad Recipes to try! Just click HERE or on the IMAGE BELOW to see them all and PIN and SAVE your faves! You left the dry onion out if the recipe. Good catch! I fixed it – thanks so much for letting me know.